Daily rental: Lowest: $40. Highest: $78. Welcome to our holiday guesthouse located in the national reservation area, Cape Phiolent known with its quiet pebble beaches, breath-taking views and crystal clear water. Breathe in the fresh sea air and the scents of wild herbs! This brand new property meets quality standards while being priced for affordable budgets. 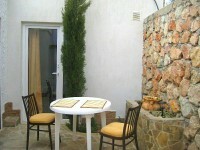 Every 22m2 room is tastefully decorated, furnished and has an en-suite bathroom, air-conditioning, a fridge etc. There is a nice and well-maintained courtyard. The beach is only a 10 minute walk away. The cozy two-storied house is located in the quiet rural setting. The village that is located within 10 km from the seacoast, is surrounded by forests and three mountain lakes are just on the outskirts. 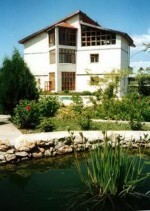 It's an idyllic place for those who are in search of a calm and peaceful country accommodation? Is located within 12 km from the seacoast. The big and nice newly built house has all modern amenities. There are three lakes in the forest near the village?